For other uses, see William Riker (disambiguation). William Thomas "Will" Riker is a fictional character in the Star Trek universe appearing primarily as a main character in Star Trek: The Next Generation. Throughout the series and its accompanying films, he is the Enterprise's first officer, and briefly captain, until he accepts command of the USS Titan at the end of Star Trek: Nemesis. Riker is played by actor Jonathan Frakes. I started with the cattle call, then the casting director, the producer, then other directors, to Gene Roddenberry, and then through the Paramount execs, including the vice-president himself and the heads of television. For the first two seasons, Riker is portrayed as a bold, confident and sometimes arrogant, ambitious young officer; however, over time Riker's character becomes more reserved, as experience teaches him the wisdom of a patient, careful approach. He becomes comfortable on the Enterprise, repeatedly turning down offers of his own command, and he learns to cherish the company of his fellow officers. Nonetheless, Riker retains a willingness to occasionally disregard the chain of command. Riker is usually referred to as "Will". He is also usually (and informally) called "Number One" by Captain Picard, because of his position as first officer on the Enterprise. Riker's background is first explored in the second-season episode "The Icarus Factor". In the episode, Riker's estranged father, Kyle, visits the Enterprise to offer his son the command of the USS Aries, which Riker refuses. We learn that: Riker grew up in Alaska; that his mother, Elizabeth (Betty), died when he was two years old; and that he was raised by his father until the age of 15, when he left home. In the episode, Riker had not spoken with his father for 15 years, but they manage to partially mend their relationship over a game of martial-arts sparring called Anbo-jitsu. In the episode "Lower Decks" a waiter at Ten Forward mistakenly states that Riker is Canadian, and in the same episode Riker clarifies that he grew up in Alaska. According to the Voyager episode "Death Wish" (in which Riker made a guest appearance), Riker's distant ancestors also lived in the United States: during the American Civil War, his ancestor Colonel Thaddeus Riker fought on the Union side, as an officer in the 102nd New York Infantry Regiment during the Atlanta Campaign. In the two-part episode "The Best of Both Worlds" Riker takes command of the Enterprise, assuming the rank of captain through a field promotion, and orchestrates Picard's rescue. This episode also explores the idea of Riker being unwilling to take chances since he had grown comfortable in his role as First Officer aboard the Enterprise. By the end of the episode, when he orders the Enterprise to fire on former Captain Picard, now Locutus of Borg, Riker has grown into a more confident leader. The sixth-season episode "Second Chances" reveals that Will Riker was duplicated long ago by a transporter malfunction. The "second" Riker takes the name "Thomas", which is revealed to be William Riker's middle name. In the seventh-season episode "The Pegasus", Riker must confront his former commanding officer, Admiral Erik Pressman, over a cover-up related to the destruction of the USS Pegasus. The Pegasus had illegally developed a radically different type of cloaking device that also allowed it to phase through matter, resulting in it becoming fused within an asteroid when unstable power consumption forced the cloaking device offline. In the Enterprise series finale, Riker appears as a never before seen cook discussing matters of life, duty, and sacrifice with the crew. It is revealed that his presence is part of a holodeck simulation of historic events that Riker initiated in order to help himself make the decision to inform Captain Picard of the illegal research once conducted by Admiral Pressman aboard the Pegasus. Before the beginning of the series, Riker was involved in a romantic relationship with Counselor Troi on her home planet Betazed. They often refer to each other as imzadi, a Betazoid term of endearment meaning "beloved". The novel Imzadi takes place before the beginning of the series and explores the history of the relationship between the two characters. The two characters are close friends throughout the series, but their relationship does not resume until Star Trek: Insurrection, the third Star Trek film set in the Next Generation era, although Thomas Riker, the duplicate created by a transporter malfunction, attempts to respark their relationship in "Second Chances". The following movie, Star Trek Nemesis, begins with their wedding on board the Enterprise-E. At the start of the film, Riker finally accepts a promotion to Captain and an offer to command the USS Titan; during the movie's final scenes he bids Picard, and the Enterprise, farewell. Riker was originally scripted as a much more serious, by-the-book officer—by the middle episodes of the first season, however, it was felt that he was too "official", and his character was toned down and became more of a ladies' man. Although Riker was clean-shaven for the first season, he grew a beard at the start of the second season that later would become something of a trademark. Frakes had grown a beard between seasons, for his role in the Civil War miniseries "North and South", and Gene Roddenberry asked him to keep it, because he thought it made Riker look more nautical. Because Frakes' growing of a beard coincided with what fans and critics perceived of as an improvement of the show's writing quality, "growing the beard" has become an internet colloquialism for a once subpar television series achieving a dramatic level of improvement. 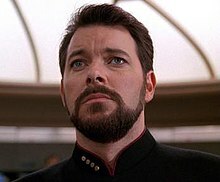 Frakes appeared in dual roles in "Second Chances", a TNG episode in which it was established that Riker had a "twin" created years earlier by a transporter malfunction. Frakes appeared as the twin, Thomas Riker, in the Star Trek: Deep Space Nine episode "Defiant", in which he impersonates the other Riker to commandeer the starship Defiant as a member of the Maquis. The following year he guest-starred as Commander Riker along with Q in the Star Trek: Voyager episode "Death Wish". Frakes reprised his role of Commander Riker in the 2005 Enterprise series finale, "These Are the Voyages...". Frakes also played Riker in an advert for Boole & Babbage. ^ Harris, Will. "Jonathan Frakes talks William Riker, playing trombone with Phish, and more". ^ Growing the Beard. TV Tropes. Schrager, Adam (1997). The Finest Crew in the Fleet: The Next Generation Cast On Screen and Off. New York: Wolf Valley Books. ISBN 1-888149-03-5. Wikimedia Commons has media related to William Riker.